SeniorPeopleMeet is one of the few dating sites that target 40+ demographics. Most users are in their late forties and older, and use the site not only to look for long-term partners but also as a platform to make new friends. While this is not the only site to target mature demographics, People Media has really made a lot for their project to function. So, if you are tired of mainstream dating apps and are looking for someone who can relate to your experiences and opinions, take a close look at our review — we’ll describe what the platform is about, how to use it, how much you’re expected to pay, etc. As already mentioned, most SeniorPeopleMeet users are in their forties and older, which gives mature demographics a chance to meet someone they will be genuinely interested in. 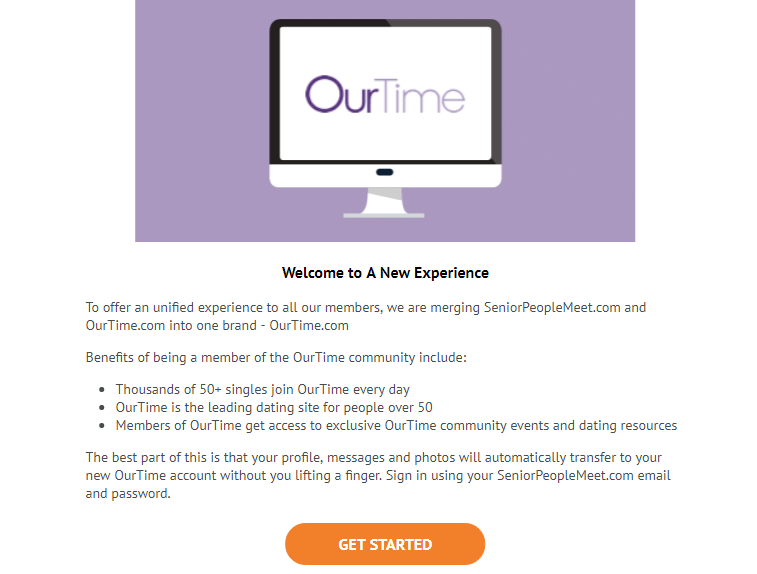 Younger people can join — there are no age restrictions on the site; however, it’s very unlikely that younger people’s profiles will get attention on SeniorPeopleMeet. Plus, to be honest — people in their thirties (or younger) have no reason to join, as plenty of other mainstream dating sites cater to 35-year-old demographics. Female users outnumber men by approximately 20% on SeniorPeopleMeet, which is a bit higher than average — most sites have an age gap of 10-15%. Apart from this gender disproportion, member structure does not have any other fallbacks. SeniorPeopleMeet enjoy an impressive 2 million visits per month, and 1.9 million of those visits come from the US alone. So, this platform is simply perfect for lonely US gentlemen looking for mature ladies. The platform has about 1.8 million users from the states, and 64 thousands of those are active every week. The registration is free and will unlikely take a user more than five minutes. The whole sign-up form has only six screens, and new members are not supposed to take any personality tests or fill in pages upon pages of information about themselves. The sign-up form requires a valid email address, and some very basic info about yourself: age, location, and a photo (actually, you can upload up to thirty of those). Once you verify your email, your account gets activated, and you can proceed to fill in more info about yourself and what you’re looking for in a partner. Additional photos can also be uploaded when you verify your profile. It’s not all difficult to find other users on SeniorPeopleMeet — the platform offers very comprehensive search algorithms that allow defining a whole range of different parameters, from exact age and location to hobbies and relationship preferences. Contacting them, however, is a different story, as SeniorPeopleMeet does not offer too many contact options to its free members. Users can play a couple of games to show their interest in other members; however, to actually send and receive messages one will need a paid membership (we’ll discuss premium membership fees and features below). As a free member, you can play a “Who do you like” game that shows you two photos of different users (with basic info including age and location). You can swipe to choose the account you like or, if no one catches the eye, skip this game altogether. SeniorPeopleMeet offers free members a total of 11 matches a day — which is not that many if you think of it. Looking up other people’s profiles is free, but the only thing a free user can do is click a ‘flirt’ button. It’s similar to Facebook like or sending a wink — and even though it shows some interest, users still need a premium membership to reach out and talk to someone they like. How good are SeniorPeopleMeet profiles? SeniorPeopleMeet does not require its users to fill in pages of info when they register. However, anyone who wants to have a well-detailed profile can compensate for it later. Profiles have plenty of generic fields (age, location, occupation, etc. ), as well as text boxes that leave some room for creativity. In these text boxes, users are free to describe themselves and the potential partners they’re looking for. You can also edit your profile info and upload new photos after you’ve completed all fields. On the whole, one can say that most SeniorPeopleMeet profiles are detailed and informative, and many of them are regularly updated. Unfortunately, there is a downside — even though most profiles give enough insight into other members’ personality and dating preferences, not all of the SeniorPeopleMeet accounts are real. The site does very little to verify their user identities, which results in numerous fake profiles. SeniorPeopleMeet does screen the photos uploaded to make sure those were not taken from the web — just like it does screen profile descriptions to ensure those are genuine texts written by real people and not just stolen from the Internet. Such precautions, however, are obviously not enough to stop the scammers — there are still plenty of ill-intended accounts, created to cheat older people of their money. So, you are to be very vigilant when using this service — never send money to other members directly — especially if you’ve never seen this person in real-time. You may hear a lot of heartbreaking stories, but this is not the place to lose your head or exercise excessive charity. You should report any suspicious activity (especially when someone asks you for money) to the site management. Truth be told, SeniorPeopleMeet works to reduce the number of fake profiles; however, most abuse reports happen after the actual fraud. So — once again — keep a clear head. SeniorPeopleMeet has made a great job customizing their site for people in their fifties. Even users who’ve never tried dating platforms before will easily find their way on this site. SeniorPeopleMeet.com navigation is comprehensive and intuitive. The same goes for its mobile version and, even though it does not add anything in terms of functional, it does not compromise on any of the desktop features either. The same functions are easily available in swipes and clicks and, despite slightly boring design, both desktop and mobile versions of SeniorPeopleMeet are user-friendly and glitch-free. Fonts and icons are easy to view, and the menu is easy to access. All menu functions are available through the top and left navigation panels — another feature People Media uses in all of its products. While it may seem that you’ve seen such an app or a site before, this repetitiveness has an upside — what the site lacks in design, it compensates for in functionality and ease of use. The latter ones are especially important for the site’s demographics. What does it cost to use SeniorPeopleMeet? There is a catch, though. Not all of the above features are included in a standard subscription plan. SeniorPeopleMeet has two membership options available — standard and value subscription. Basically, a standard subscription allows users to contact other site members via emails and receive messages. Value subscription allows users to see anyone who’s viewed or favored their profile. All other features, such as sending gifts and having your profile filled in by pro writers, are available at a separate cost. This comes in a form of extra credits users can purchase. The number of credits you’ll need depends on how many perks you plan to order. The upside is that credits come at a fixed price of $0.04. Credits are available in packages of 25, 110, and 280 tokens per purchase. As for subscription plans, their price will depend on the subscription term. The longer it is, the lower the price. Standard subscriptions for one month comes at $29.96; six months — $15 per month, or a single payment of $90. Value subscription is only available for a six-month period and costs a total of $101.94, or $16.99 a month. All in all, choosing a value subscription can be beneficial for users determined to stick with SeniorPeopleMeet, as it offers more functionality at a slightly higher cost. Also, value profiles have a different background color, which helps them stand out from the rest of the accounts. Premium members can use credit cards and PayPal to pay for using the service. Payments via mobile app are also possible. Note, though, that all first payments are taxable; so you will be charged an additional processing fee ($3.99). Even though these features are only available for paid users and usually come at a separate cost, some of them may prove useful. These services are designed to allow user profiles more visibility, which, in turn, results in more potential matches and more enjoyable dating experience. SeniorPeopleMeet offers plenty of virtual tokens of affection, including flowers, candy, and plush toys — all electronic, of course. On the face of it, the idea of sending your potential match a virtual bouquet may seem off-putting. But, if you think that a pretty lady gets dozens of messages every day, you’ll understand that getting her attention to your message deserves a couple of extra tokens. This feature gives users a chance to hire one of the SeniorPeopleMeet internal writers to have their profiles properly polished. It may come handy for those people who aren’t too versatile with words or simply don’t have the time (or the desire) to strain their creative muscle. Remember that carefully filled in profiles help not only to showcase yourself from the best angle; they also give your account more visibility, which results in more matches and incoming messages. One more way to boost your profile visibility is to actually place it on top of the search results. This is what PromoteMe feature is about — it places your account in the top three positions for users searching someone with your personality traits. This one is a virtual phone number that gets you in touch with other users, without revealing your real-life contact details. The service comes handy at a point when you want something more tangible than chats, but are not yet ready to set an actual date or share your real contact details.